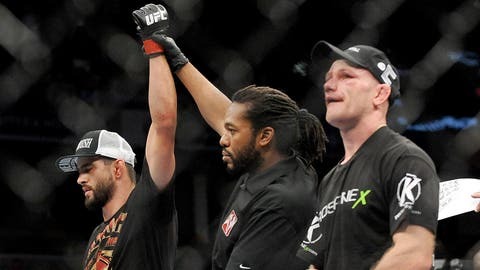 Three wishes for 2014 and time to tweak the judging system in MMA? MMA judging has been a hot button issue in 2013. MMA judging is forever in the spotlight. Good, because it needs clarification in my view. We’ve seen a few controversial outcomes in 2013, moreover. While we will never get away from the fact that fight sports are judged subjectively based on the criteria of the 10-point must system - hence three judges – it appears there is a need to tighten the system, clarify the blurriness at the edges of the criteria on which a fight is marked, and perhaps, dare I say it, bring in some changes. Effective grappling includes takedowns from standing position, progressing passing the guard to mount position, and using an active threatening guard from the bottom. Could the referee to be a ‘fourth official’? He is in place and has better view than almost anyone of the action. Octagon control is judged by determining who is dictating the pace, location and position of the bout. Effective aggressiveness means moving forward and landing legal strikes. In the judges’ criteria, striking and grappling are of top priority, then Octagon control, then effective aggressiveness. I know there are many nuances within my breakdown, but broadly-speaking, the criteria are as above. My view is this – two tweaks would give the three judges, seated around the Octagon, clarity. Firstly, could the referee to be a ‘fourth official’? He is in place and has better view than almost anyone of the action. Just an idea. Secondly, the judges should be encouraged to use the breadth of the round-by-round ten-point-must system. Judges could be encouraged to score a dominant round more readily, to 10-8, or even, if it is a landslide round, 10-7? It is within their power to do so, yet it rarely appears to be used. But just scoring 10-8 rounds would make a difference. Come to that, drawn 10-10 rounds are rare, too. Referee Marc Goddard, one whose opinion I value deeply, believes a 10-10 round should be as rare as a snowball in hell. How many of us, when we criticize judges, are aware of the small print in the judging criteria ? Many of us often go on the ‘feel’ of a fight? Some of us scribble notes on every move, some are watching live, some on television, while some are swayed by commentary. From experience, too, I have learnt that a fight watched on television differs vastly from a fight watched live. Moreover - and this is an important point - it is irrelevant if you watch a fight a second time and score it differently. Judges see a fight once, live, and the decision is set in stone. 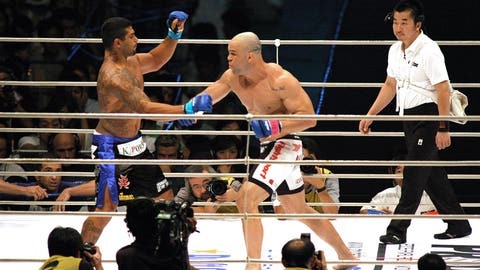 Reformists have often pointed to the system used in Japan by DREAM or the erstwhile PRIDE FC as a possible alternative way of deriving a more fitting outcome to close contests. In DREAM, the three judges score a contest in its entirety. Attacks to finish a fight are also marked up. The judging system in DREAM does at least allow for an overview of the entire contest. Likewise Pride. There are those arguing that better decisions come from scoring a fight as a whole episode rather than scoring it round-by-round. But I would argue there would not have been a need if the judges use the fullness of the 10 points must system effectively. No system will ever be immune from dubious decisions, because close fights will always been seen differently. We are in a sport of opinions. And we will never get away from that. No system will ever be immune from dubious decisions, because close fights will always been seen differently. 1. Escape from the procrustean New York State legislation which has precluded Mixed Martial Arts from Manhattan, and the start of UFC events at Madison Square Garden. When the historic event takes place, it will be a ‘must-see’ for fans from all over the world. It’s time to shift the paradigm against anti-MMA propagandists within politics. There is a proximity to fighters and fans that few sports have. As 2013 enters its final days, may that never change.